New: Is the government doing enough for education? Whose responsibility, state or the commonwealth? Why cut? And this argument was mirrored in the Commonwealth’s strong reaction: You cut, We cut! Any results? 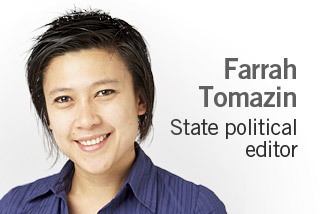 Opinions from Farrah Tomazin, The Sunday Age’s state political editor. 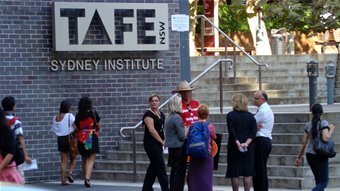 On September 11, NSW government announced major cuts to its TAFE colleges since Jan 1, 2013, as part of a broad education cuts to save $1.7 billion in the next four years. It is estimated about 800 TAFE jobs will go and TAFE fees will increase by 9.5% from next year. The hardest hit will be with TAFE fine art courses, including visual arts and ceramics which will be charged at commercial rates. Community response: TAFE cuts will lead to job loss in Lismore TAFE creative industry faculty and skyrocketed fees will diminish the prospect of future intake. While Victorians are sinking deeper into their ongoing battle. “In May the government announced plans to slash an estimated $290 million from the TAFE sector… The TAFE Association estimated the funding cuts would lead to about 2000 redundancies at TAFE institutes. But the government has defended TAFE funding, saying it is spending an extra $1 billion over four years on apprenticeships and areas of skills training, ” The Age reports. 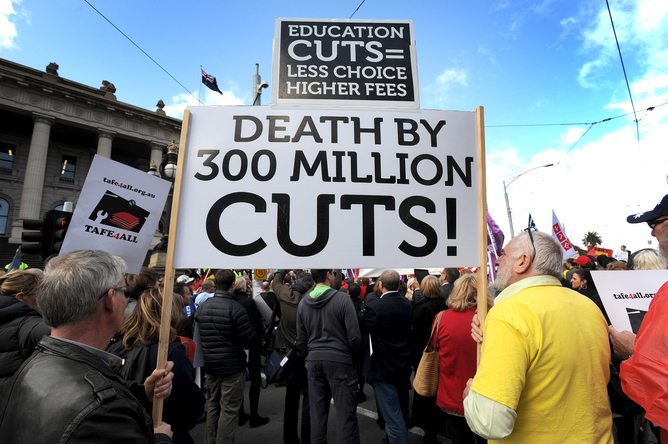 Federal government joined in to pressure against Victorian cuts. ”We don’t want to take money out of the Victorian TAFE system, but there’s clearly no point in us pouring money in if they’re taking money out on the other end,” said the federal Tertiary Education Minister Chris Evans. 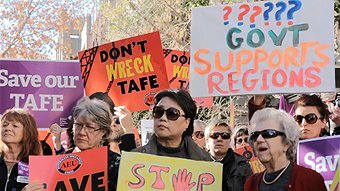 On September 20th, more protests in Victoria after TAFE “transition plan” leak on possible facility sell-off and campus merger/closure. What are people saying… and what do you have to say? Join the discussion! Victorian TAFE teachers, students and parents sharing their stories in response to TAFE cuts. Paul Livingstone, the co-writer of the the animated feature film, Happy Feet Two and the former art student at TAFE blogged about his disappoint at the TAFE cuts. Deborah Gower, a former TAFE art student and working ceramic artist advocates the arts community to appeal. 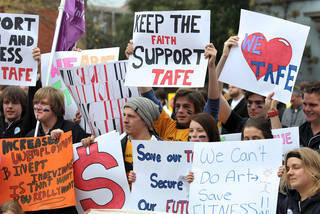 Ted Baillieu has ripped $290 million out of TAFE. Sign the petition. This Storify post will follow the development closely and run updates in the days to come. You are welcome to join the discussion either by leaving comments or news links. Let’s talk about it! !